Topical pain relievers will help you find relief if you are dealing with minor joint and muscle soreness. Topical pain products can come in a few different forms including cream, gel, foam, patches, spray, sticks or roll-on (gels). As well as muscle and joint issues, some pain relieving creams may help to ease arthritis. Using a cream or gel can be a great alternative to taking a pill, not only do you not need a prescription, but they can work right away unlike pills that take time to start to work, they also have fewer side effects than oral medication. Unfortunately, not all creams or gels work well for everyone for all different types of pain, so most people will have to experiment with more than one product before finding something that works. 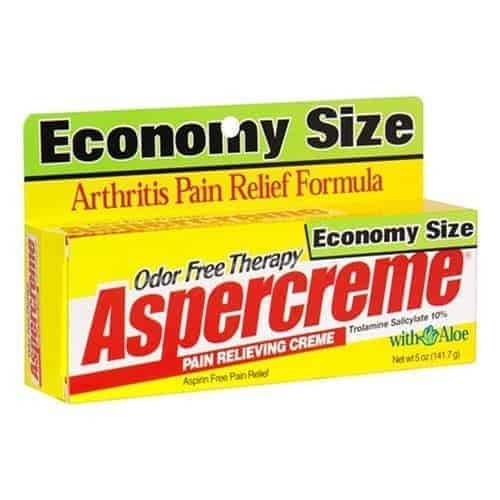 We have put together a list of some of the most popular brands and researched what you need to look for when buying a pain relief cream for joint and muscle soreness. There are so many different types of creams and gels that claim they will help relieve your pain; it can be hard to figure out what may work for you. You may have to try many different brands until you find one that will work for you. Before beginning your search, you can think about what type of topical product you would like to use. Do you prefer creams or gels, or maybe a roll-on would work well for you? You can also think about whether you want cooling, heating or no effect at all. The scent is another essential feature of these types of topical pain relievers to consider. As mentioned above, unfortunately, to find products that will work for you requires a bit of trial and error. There are a lot of factors that go into whether a product will work or not. Sometimes it is the type of pain that you are having; sometimes other medical conditions can play into whether a particular product will be useful; most products won’t work for everyone. Check with your doctor to see if they have any recommendations for over the counter products to try. A number of the companies that manufacture these types of creams and gels offer a money back guarantee, so make sure you take advantage of any satisfaction guarantees that are available if something you have bought isn’t working for you. Counterirritants include ingredients like menthol, camphor, eucalyptus oil and methyl salicylate (oil of wintergreen). These types of elements have a heating (capsicum or methyl salicylate) or cooling effect (menthol). They work by distracting you from the pain by creating a different, milder sensation. The main advantage of counterirritants is that they work almost immediately, although the effects may not last very long. They work best for minor muscle and joint soreness. Salicylates are a type of nonsteroidal anti-inflammatory drug. The anti-inflammatory properties are excellent for reducing pain and inflammation in conditions like arthritis. Salicylates are the same pain-relieving ingredient that you would find in aspirin. They work by blocking the transmission of nerve impulses when the cream absorbs into the skin. Creams with salicylates work well for soreness in joints close to the skin, areas like fingers, knees, and elbows. If you are allergic to aspirin or taking blood thinners, you should consult with your doctor before using any products that contain salicylates. Capsaicin is a natural, odor-free element found in hot chili peppers. It works as a counterirritant, creating a burning sensation and blocking the skin’s pain receptors. Creams with capsaicin tend to work well for arthritis in joints. Users may have to apply them for a few weeks multiple times a day before you feel relief. The Arnica plant has been used as a pain reliever to help reduce inflammation for hundreds of years. You can use creams or rubs that contain arnica for sore muscles, aching joints, injuries and to help with inflammation. They work best if used over a period of time. Overall the benefits of using a topical cream vastly outweigh the cons, with the caveat that you can find one that works for you. Creams and gels have the advantage that they can provide fast, effective relief. You can also target the cream to where exactly the pain is occurring. They are safer than pills to use because there are not many serious side effects associated with topical relievers. They can also be more affordable than prescription medication. Penetrex is a very popular option that works well for a lot of people. It requires repeated applications over a period of time (10 days plus) before you will begin to feel relief, so if you need immediate relief, there are probably better options for you. Many users report that when used over time Penetrex can help provide a more permanent relief than other products. The scent of the Penetrex is very mild, and it absorbs into the skin very quickly. Since it is a little bit pricey, it may only be a good option if you are treating a smaller area. If you find that it doesn’t work for you, you can return it for a full refund. 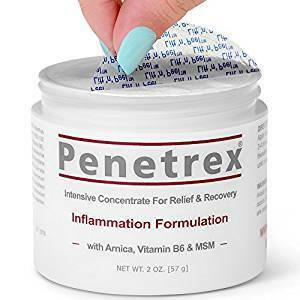 Many users find that Penetrex is very useful in relieving their pain. 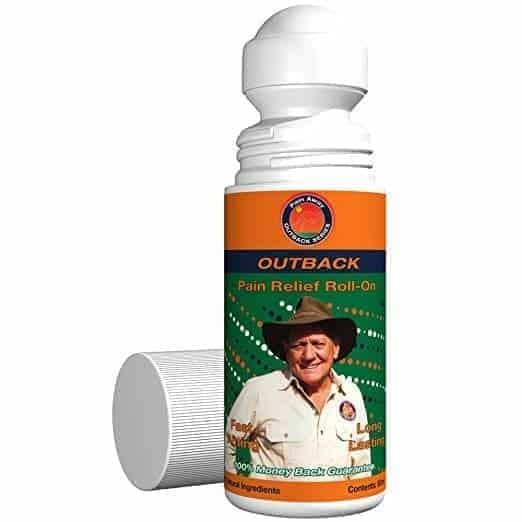 It doesn’t use heat or cooling effects, and the texture is light and absorbs very quickly, so you don’t have to worry about it being greasy and staining your clothes. The scent is also not very strong; you can use it liberally without being overwhelmed by odor. If you are looking for immediate relief that will last for hours Sombra is a great option. 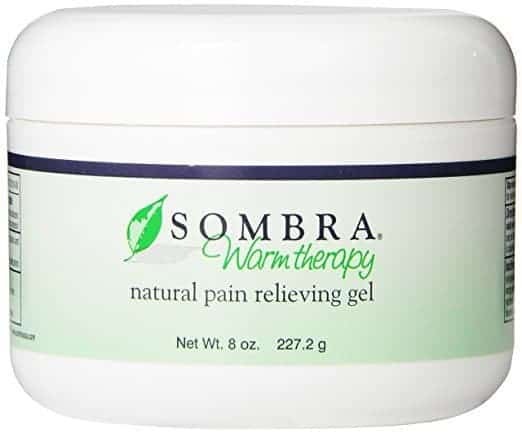 It there are two types of Sombra: a warming version and a cooling version (Sombra Cool Therapy Natural Pain Relieving Gel). The warming gel works immediately to help ease aches. If you do purchase the Sombra gel make sure you do a patch test on your skin before putting it on a large area, some users do find it to be very intense. Also, make sure you wash your hands after applying and don’t get it anywhere near your eyes. Sombra is a good option if you need to do a large area because a little bit of the gel goes a long way, so the container should last a while. Users love the effectiveness of the Sombra warming gel. Most users love the citrus and menthol scent, although it can be a little overpowering when first applied. Ingredients: Active: Camphor 3%, Menthol 3%, Inactive: aloe vera, Capsaicin, carboner, decyl polyglucose, deionized water, citrus extracts, rose-water, etc. 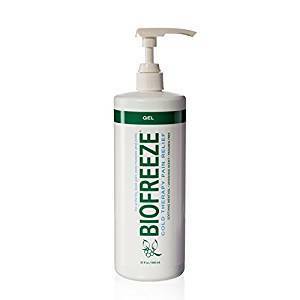 Biofreeze is another one of the most popular topical pain relievers. The active ingredient is menthol, so it gives an immediate cooling sensation to sore muscles and aches. It is a good option for larger areas like the back and shoulders. Users love that it is absorbed quickly (although this makes it not a good option if you are looking for something for massage). It has a menthol, camphor and peppermint odor which a lot of users like, although it may not be for everyone since it is quite strong when you first put it on, the scent does subside quickly one the gel is absorbed. 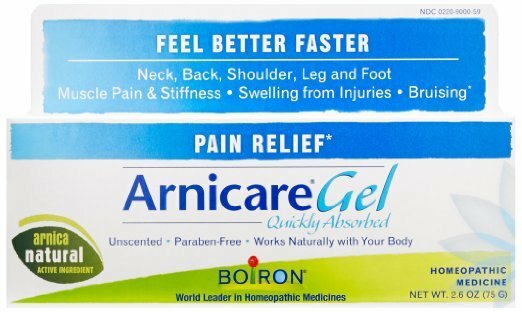 If you are looking for an Arnica based gel, the Boiron Arnicare Arnica Gel is a very popular option. It will help alleviate a lot of different types of aches and may help with healing sore muscles. It also works to heal bruises. Users love that it doesn’t have a scent. It is also very popular with reviewers who don’t like to use counterirritants due to sensitive skin or just not enjoying the heat/cooling effect of many other products. Many users find that it is soothing and does relieve their soreness very quickly. It is an excellent product to include in an overall pain management system (along with other treatments). 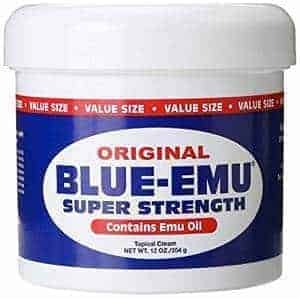 What ailments can topical creams rubs and gels help with? Read safety instructions and ingredient lists before using any of these types of products. Wash your hands after applying the product; don’t touch your eye area with topical still on your hands. Don’t use products more often than recommended as they can lead to allergic reactions. Don’t use heating pads after you have applied a topical product as it may increase your risk of burns. If your skin begins to burn or itch or the skin turns red, stop using the product immediately. Don’t use any topical creams on areas with broken skin or an open wound. Topical pain relief products are not intended to take the place of your prescription medication or medical treatment. Individuals who are taking blood thinners or are allergic to aspirin should ask their doctor before using pain relief creams that contain salicylates. If you are looking for different ways to help treat your pain, topical relievers are well worth considering. They work quickly, are inexpensive and are readily available at any drug store. You can get scented or unscented products, with cooling, heating or no effects. They can treat different types of aches and in some cases help with the healing process. 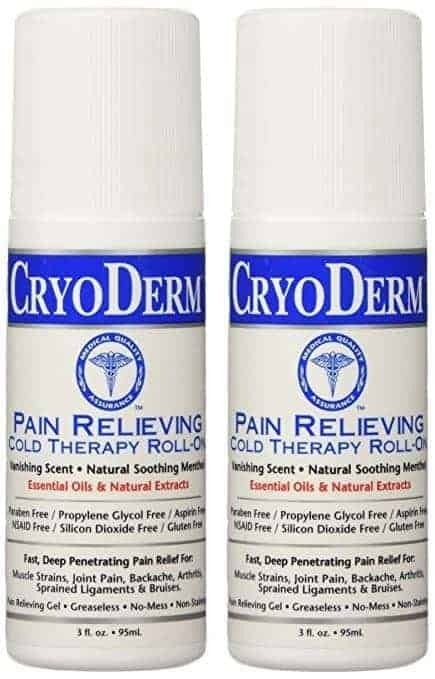 The only major downside to topical relievers is that it may take some trial and error to find something that works for you, but when you do find the right product, it can be incredibly helpful with your pain management.